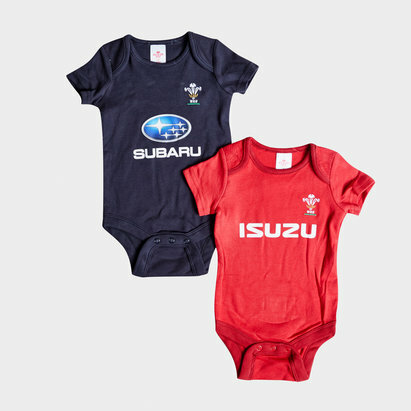 Show your pride for the daffodil and start your baby off as a Welsh supporter whilst they're young in this Wales WRU 17/19 Infant Bodysuits 2 Pack in Red and Black. This infants pack of 2 bodysuits are perfect for your baby any time of the day but even more so now with the Autumn internationals and the 2019 Rugby World Cup coming up. These bodysuits showcase your love for your national side whilst keeping your baby clean. Similar to the colours of the home and alternate kits these bibs feature the colours red and black. 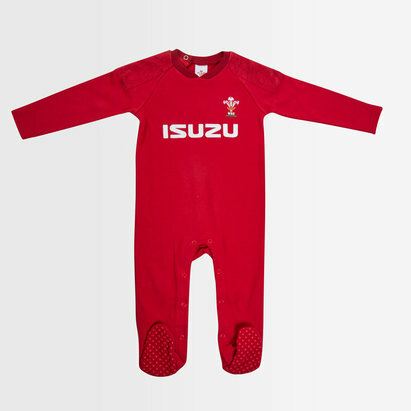 One suit is red and has the Welsh badge on the left with the team's sponsor - Isuzu - printed across the middle. The other suit is black and has the Welsh badge on the left with the team's sponsor - Subaru - printed across the middle. Both suits use poppers for easy access.